Stella Arnaldo's Blogspot: Still no. 1! I'M PROBABLY one of the handful who has never watched a Manny Pacuiao fight before. Shame of me, I know. It's just that I really never liked boxing as a sport. It's a lot of punching, bloody faces, or knockouts that often lead to permanent brain damage for some boxers. It's a cruel sport which I could hardly stomach. But after hearing that Pacquiao's fight with Antonio Margarito could be his last (or so his Nanay Dionesia believes), I just had to see the match just this time. Having read all the news about it, I knew that Margarito was taller and heavier than Pacquiao so it looked like a lopsided fight in his favor. Sports writers said, what gave Pacquiao the edge, despite his shorter height, was his speed and the strength of his punches. Logging in to my favorite online streaming TV provider, where I usually watch my Star Trek and Battlestar Gallactica reruns, History Channel, and all-day Family Guy, I searched for "boxing", and hit the jackpot. Soon my Mac was streaming the pre-fights to the Pacquiao-Margarito battle, and I later hooked it up to my TV set and to some speakers. I just had enough time to cook and eat my lunch, before settling down to watch the biggest boxing match of the year. Each round quickly went by, as Margarito tried to force Pacquiao to the ropes. But the latter already learned his lesson a few times before, and quickly moved back to the center after absorbing some of Margarito's blows. By the fifth round, Margarito's defeat was almost palpable as his right eye became bloodied and bruised, almost swollen shut. Pacquiao hit the wound in the succeeding rounds, forcing the cut to reopen and bleed again. But Pacquiao is a gentleman. He knew that he could even knock out his opponent in the 11th round. But by the 12th, he just let the minutes pass by, dancing around Margarito but not hitting him. He was taking it easy and knew that he had already defeated the Mexican tornado, who by then, had already been dubbed "Maga-rito" by the ever reliable witty tweepers, because of his swollen face. 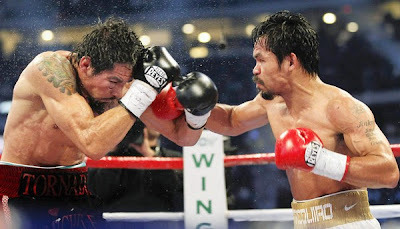 In contrast, Pacquiao's face was quite relatively intact despite some side blows connecting from Margarito. To his credit, the tough Mexican finished the fight to the very end, even though the odds were stacking against him, and he could hardly see Pacquiao. Very courageous man. Then it was all over. The bell signaling the end of the 12th round clanged. The crowd roared as they knew who the winner of the bout was. Pacquiao, as his usual habit, knelt in his corner, praying and thanking the Lord. As he wore his 8th title belt, and was interviewed by the host, Pacquiao had this to say about his opponent: " I was surprised that he was very strong. I'm very lucky I won." Asked why he took it easy on Margarito in the 12th round, Pacquiao responded: "I did not want to damage him permanently. That's not what boxing is about." But that is what a great boxer is really about. It's not just the strength or quickness of one's punches, or how one's body can mightily absorb a multitude of blows from his opponent. It's also about grace and magnanimity in the face of victory. Ang galing mo Manny. Hanga ako talaga sa yo. You do all of us your countrymen, proud. What a great day to be a Filipino. Review of the fight in the New York Times and in the Chicago Tribune.